Pivotal Motion Physiotherapy offers comprehensive physiotherapy services including but not limited to: everyday physiotherapy, exercise classes, spots physiotherapy, hiring of sports trainers, physiotherapy for teenagers, pre-employment assessments, pre- and post-rehabilitation, workcover physiotherapy, DVA physiotherapy, enhanced primary care and more. We are conveniently located in Newmarket, inner North Brisbane and are easily reachable for client from Brisbane suburbs including Wilston, Windsor, Alderley, Ashgrove, Enoggera, and Kelvin Grove. Dynamic Sports Facilities is one of Australia's leading and longest standing sports facility construction and refurbishment companies. We work with you to design a sports entertainment hub on your residential property - to your budget. There is nothing more satisfying than turning a backyard or a paddock into somewhere to play sport while creating an aesthetically pleasing feature that is befitting to the people who come to participate or admire the game. …To break the first sod of soil and take great pride in the supervision and construction is what excites us! We set a budget with the client, enter into a fixed priced contract and guarantee to complete construction on time. Tina Saidi realeste agent .Ray white Centenary. Whether you want to shoot hoops with friends or plan a safe kids play area for your little ones, there’s a Taigum, Queensland professional on Houzz that can help you turn your backyard dream into a reality. 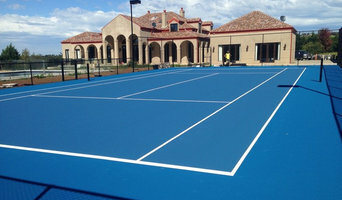 Sports court and outdoor play specialists in Taigum, Queensland design, install, repair, resurface and replace sports surfaces, including tennis courts, basketball courts and playgrounds. They have a thorough knowledge of sport rules, regulations and standards, such as court dimensions and net heights, and are required to stay on top of the latest sporting technologies and flooring systems. They can assist with planning and council approval before construction begins, as well as other unforeseen requirements, such as drainage and retaining walls. Aside from surfacing, they can also provide lighting, fencing and equipment to complete a recreational area. Find a sports court and outdoor play professional on Houzz. Scroll through this page to find professionals that specialise in playground and sporting surfaces in Taigum, Queensland, as well as play equipment and accessories. You can browse their latest projects, read reviews to see how other homeowners rate their work, and message them directly.